A student at Kabul University in Kabul, Afghanistan. Since American forces drove the Taliban out of Kabul a decade ago, enrollment in Afghanistan’s universities has grown exponentially. The Afghan government projects more than 100,000 students will attend college by the year 2014, up from less than 10,000 in 2001. The problem: by western standards, there aren’t enough qualified professors to teach them. That’s where Purdue University has stepped in, flying six Afghan college instructors 7,000 miles to Indiana to learn what makes an American university tick. Participants in the Afghan Junior Faculty Development Program aren’t in West Lafayette for a degree; they’re on campus for ten weeks of State Department-funded training from Purdue’s Center for Instructional Excellence on how to be more effective classroom teachers. 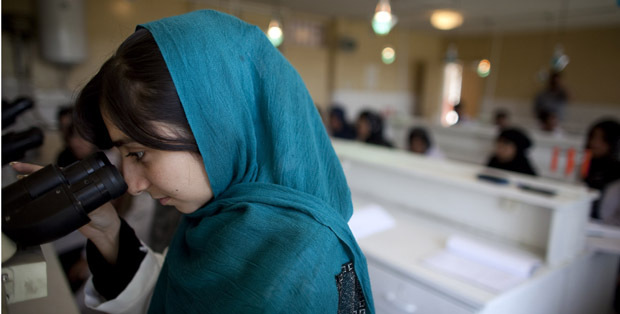 Junior faculty member Forouzan*, 27, who teaches languages at her Afghan university, considers teaching a civic duty. The biggest difference between the junior faculty and their American counterparts? Academic degrees. Two of the six program participants have master’s degrees. That’s typical among Afghan college instructors, most of whom have no higher than a bachelor’s degree. Most Afghan universities don’t offer master’s-level courses in subjects other than Dari and Pashto, the country’s official languages. Kevin McNamara, an agricultural economics professor who oversees the junior faculty at Purdue, says the program helps Afghan faculty members get says standards in Afghan universities are very different than in American universities. Students generally don’t have homework, he says, and faculty often aren’t expected to conduct research. But there’s a hope underlying the program, McNamara says, that junior faculty members’ experience at Purdue will help them get a foot in the door at a university where they can earn a master’s or doctoral degree. Several of them hope to apply for Fulbright Scholarship to study abroad again. Deputy Assistant Secretary of State Jim Moore, who helps oversee the junior faculty program at universities nationally, adds the experience doesn’t just open doors to higher credentials. American University of Afghanistan in Kabul. The junior faculty members seem to agree on one particular challenge to Afghan higher education in the future: security. Look at university laboratories, says Masoma, 32. “Most of them have been damaged,” she says, “They have been devastated during wars, but they are not rebuilt yet, so we have some problems in some disciplines that need practical work,” such as pharmacy, nursing, or medicine. The fall of the Taliban has greatly increased security, the group says, and opened doors to education for Afghan women. But in rural areas — “the provinces” — change has been slower to come. But Forouzan says increasing security will create the safe environment in which Afghans can work and become educated. “Most Afghans are suffering from this mental disturbness. They are very worried about the families, the future of the children, if the black days or black years are coming again to Afghanistan,” she says. There are other challenges a university student in Afghanistan faces. To access universities in cities, students in rural areas need better roads. Many only have internet access once they’re at school. That, the faculty members say, is a matter of time and money. But the enrollment boom in Afghan universities gives faculty members reason to be optimistic. “The graph shows that we’re moving up, we’re not moving down,” says Farhad, 26, the only male junior faculty member in the group. Farhad says some universities are now trying to offer Master’s-level and doctoral courses so Afghans don’t have to spend money on foreign education to earn higher credentials. It hasn’t happened yet. But Farhad says it won’t be long. ← Mailbag: Did Media Hype Fuel Debate Over Beef Filler In School Lunches?